2002 Gold Cream American Quarter Horse Stallion Peppy Bar Cougarand. Thanks to the owner, Miss Robyn Martin, for providing photos of this lovely stallion. Peppy Bar Cougarand is standing at stud in Woodville, TX. 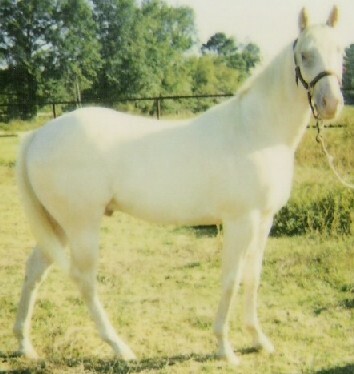 He carries both a champagne gene and a cream dilution gene, increasing the chances of a dilute foal.